The Incredibles 2 finally arrives in just a couple of months, bringing the 14-year long cry from fans for a follow-up to Pixar’s beloved superhero classic to an end. It looks to have found a fresh twist on the format of the first movie, too, as it will focus on Holly Hunter’s Elastigirl this time around, rather than her husband Mr. Incredible (Craig T. Nelson) like before. Following the triumphant victory of the Parr family at the end of the original, public favor will be starting to change back towards the supers community when the sequel begins. To make the most of this, new characters Winston and Evelyn Deavor (Bob Odenkirk and Catherine Keener), brother and sister PR gurus, will take Helen Parr under their wing and rebrand her, in the hopes of drumming up more support for supers. Part of that rebranding will involve Helen getting a brand new suit and a cool red motorcycle to go along with it. Unfortunately, with Helen busy crime-fighting, Bob will have to stay at home with the kids…which he’s not too crazy about. 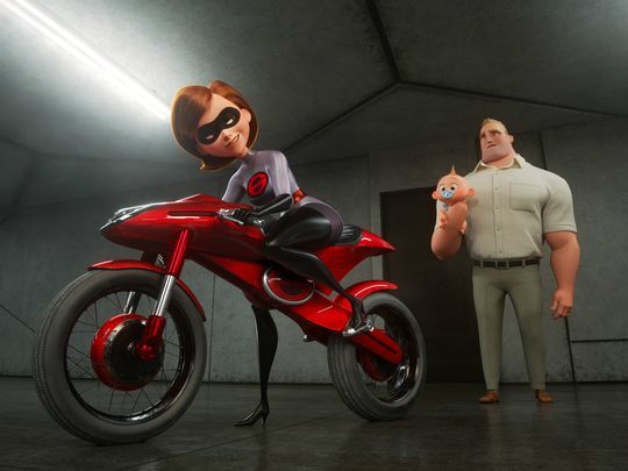 Nevertheless, this new status quo is made very clear in a newly released image from the film, which sees Helen about to head out for a mission, while Bob remains behind with their ultra-powered baby Jack-Jack. Outside of Helen, Bob and the Deavors, old fan favorites will be back, too, including Samuel L. Jackson’s Frozone and fashion designer Edna Mode (memorably portrayed by director Brad Bird). As for the rest of the titular family, Sarah Vowell is again voicing teen daughter Violet Parr, while son Dash is now played by Huck Milner (replacing the original’s Spencer Fox). So far, Pixar’s been doing a good job of keeping a lid on all the twists and turns of the sequel but, from what we’ve gathered from the trailers, it promises to be another fun-filled adventure for the whole family. Whether the pic will match up to its predecessor or not remains to be seen, but we’ll find out when The Incredibles 2 lands in cinemas on June 15th.